Mr John Andrews is a full time spinal surgeon with over 10 years’ experience at consultant level. He qualified from Cardiff University medical school in 1992. After basic surgical training he completed orthopaedic specialist training on the all Wales programme. He is on the orthopaedic specialist register. After this he specialised in complex spinal surgery completing two spinal surgery fellowships in Nottingham and Newcastle. He has practised as a full time spinal surgery as a consultant since 2005. His current full time NHS post is at the Royal Victoria Infirmary in Newcastle-upon-Tyne. Mr Andrews specialises in adult and children’s spinal surgery. He has published book chapters and original research in medical journals. 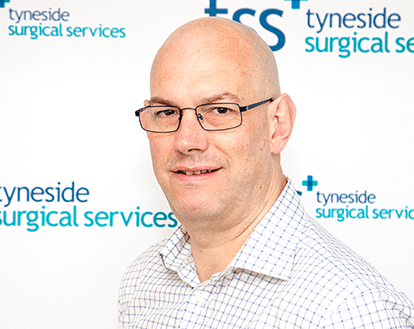 He has a keen interest in medical education and regularly chairs training courses for spinal surgeons in Newcastle. He also lectures on international courses and symposia on spinal surgical techniques and practice. Out of work he is married with three young children and he has a keen interest in sport.